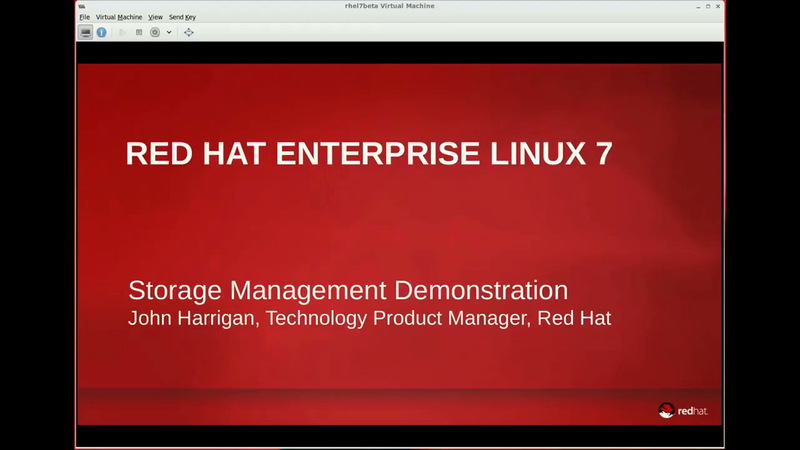 In this demo, John Harrigan shows how storage management works in RHEL 7, including two new interfaces - System Storage Manager and LibStorageMgmt. This would be more helpfull if the ssm command existed on a newly created server after selecting the 'server with gui' software selection item. Running 'yum install ssm' finds nothing. @ Catherine , it works with latest update. The problem was in beta version. If you select 'server with gui' that doesn't install the server packages. Got it. I did install the official release. It had just been posted because the first time I accessed the download site it was still 6. A few hours later 7 was there so I figured I might as well go for it. Not a bad tool, but I do miss the request and creation of the directory that the file system mounts on as well as the automatic updating of the /etc/fstab file that the system-config-lvm utility did in addition to the creation of the underlying logical volumes and file systems. Thanks John Harrigan for nice demonstration. For some reason, the systemd startup video links here. Very confusing ! John, I'm not seeing that happen for me. Both the systemd videos I checked on play their correct videos. What browser are you checking in from, and where did you access the systemd video that brought you to this one? I re-tested and now it's working fine. I got here via an email I received the other day entitled "Faster start up, refined process control & enhanced logging with systemd". For some reason when clicking on the first video (using Chrome) it brought me to this video instead of the systemd one. Perhaps I'm going mad ? Anyway, it's working now. Thanks for checking. Ah - sorry about the incorrect link, John. We'll investigate the email on our end and issue a corrected link if necessary. Thanks for the heads up! I'm have RHEL 7.5 , the ssm is not available. How to get it please ?